In an ancient deserted and beautiful city, mysterious figures move: they are the “Ghosts in Pompeii”, which Dario Assisi and Riccardo Maria Cipolla tell with forty-one shots, on display at the National Archaeological Museum of Naples from October 31, 2018 (vernissage at 17) as of 8 January 2019. The two photographers embark on their creative journey getting lost in the streets of ancient Pompeii and staring, with the goal, glimpses of ruins and landscapes in the shadow of Vesuvius: very few human presences, as if the city was suspended in time, immune from tourist flow that characterizes the daily dimension at the threshold of the third millennium. The next moment of the research is offered by the study of the frescoes and mosaics of the MANN: in the halls of the Archeological, the shots focus, rather, on the characters, on the men and women who populated the creativity of the artists of the past. 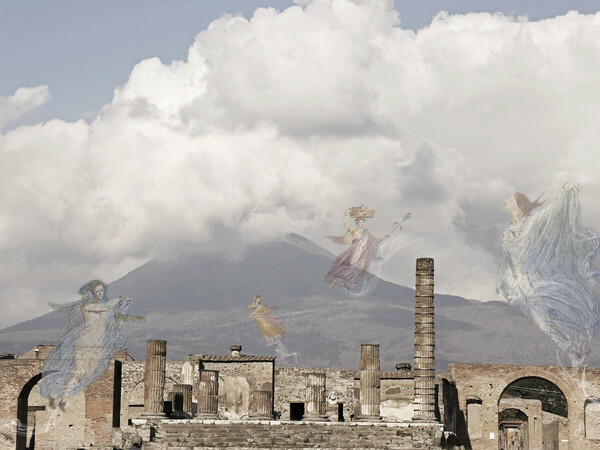 The digital technologies do the rest: the pictorial representations and the mosaic decorations are cut out and made evanescent, so as to be overlapped and suspended in the magical scenery of Pompeii. 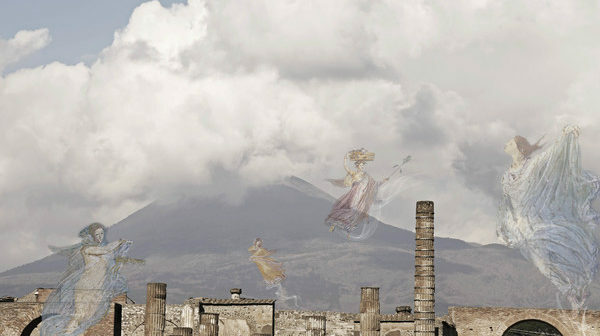 “We imagined to close our eyes letting ourselves be transported by imagination; we strolled through the ancient streets, accompanied by a mysterious melody and the ghosts that returned to their home “, commented Dario Assisi and Riccardo Maria Cipolla, retracing the process that led them to the creation of the exhibition” Ghosts in Pompeii “. Thus, thanks to the photomontage, a young woman, while nursing her baby, is protected by the distant, yet present, gaze of a mother of yore; a girl emerges from an ancient painting to caress a little dog; some magical female figures float in a cloudy sky that encloses, as burdened by a modern eruption, the columns and roofs of Pompeii. “Setting up Ghosts in Pompeii, we have approached the photographic creations of Dario Assisi and Riccardo Cipolla to some works of the mosaics section and frescoes: in this way, the encounter between past and present produces suggestions immediately perceptible to the eyes of a visitor who chooses an emotional approach to the work of art “, says Museum Director Paolo Giulierini.